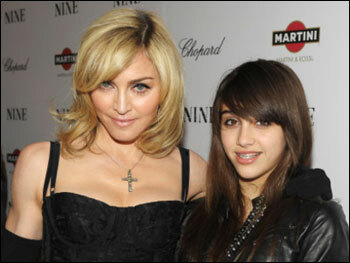 Home > Current Buzz > Is Madonna's daughter Enrolling at the FAME School? Madonna's Daughter Enrolling in a High School Near You? The “Fame” school might soon be getting another dose of fame. Madonna’s eldest daughter, Lourdes Leon, may be enrolling into LaGuardia High School of Music & Art and Performing Arts in the fall, says the New York Daily News. Earlier this month, Madonna told Us Weekly that the 13-year-old Lourdes was admitted to a “performing-arts high school” to major in drama. Now Lourdes is said to have auditioned for LaGuardia, known for being a setting in the “Fame” musical and movie. The singer’s publicist, Liz Rosenberg, only confirmed it is likely that Lourdes would attend school in the city. "They live here now," Rosenberg told the News. "Madonna didn't tell me, and I know she's not going to tell." Feelings among the students at LaGuardia are mixed about Lourdes possible attendance. Some, believing she was given a private audition and thus not subject to the pressures of a usual public one, are concerned about preferential treatment. "A lot of kids are talking about how she had an advantage," freshman drama major Brittany Evans, 14, told the News. "LaGuardia is a great school. It really is, but I think that sometimes it wants to be more of a 'Fame' school." Other students are more welcoming to the idea of being in school with Lourdes, and the potential patronage of her multimillionaire mother. "I hope she comes in handy for when they come around for parent donations," Karem Penalo, a 16-year old junior arts major, told the News of Madonna. City Education Department and LaGuardia officials are all keeping quiet. "I've asked," Luther Cherry, a 16-year-old member of the school's student government, told the News. "[School officials] said, 'We don't know until students show up.'"